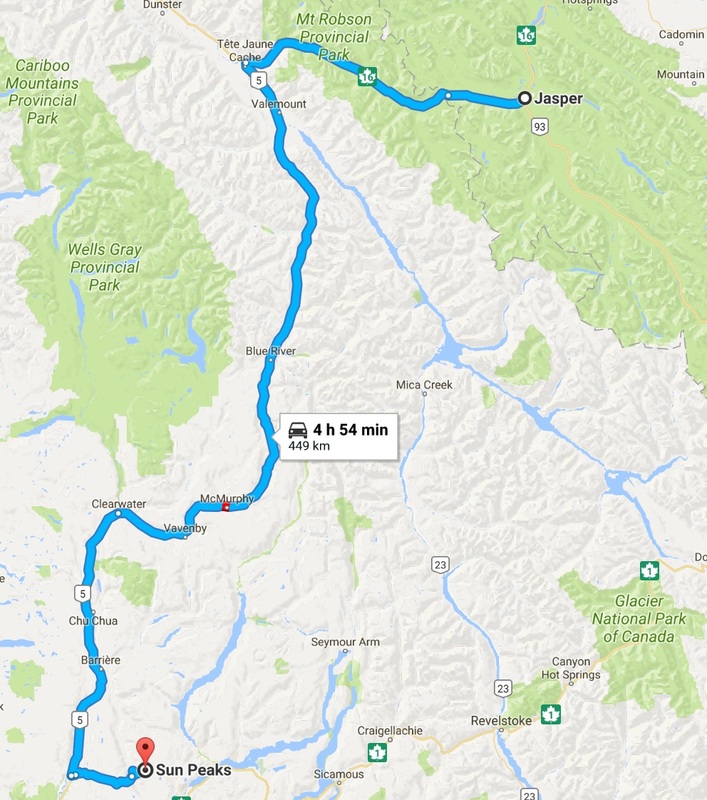 Not long after that we pass through Tête Jaune Cache and transfer off the Yellowhead Highway proper to Highway 5, confusingly called the Southern Yellowhead Highway. It’s important to keep track of the highway numbers, otherwise we’d be well on the way to Prince George. 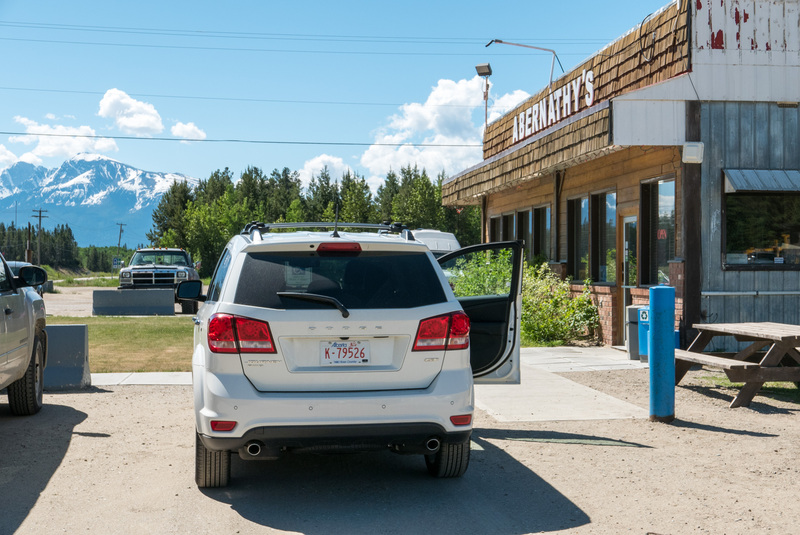 A couple of hours or so out of Jasper, near the town of Valemount we began to feel a little thirsty. At this point the road was pretty much straight as an arrow running along a wide valley floor. It doesn’t feel even slightly like the Rockies even though there’s always a few mountains in the distance. We spot a roadside diner on the right that looks at least halfway decent and turn in. This turns out to be McLennan’s Truck Stop with an attached Abernathy’s Restaurant. Inside the restaurant was very much old school, with well-upholstered wooden booths and mostly local clientele. It’s a shame we weren’t eating there because the food looked good and tasty. Duly refreshed we set off once more. The weather so far had been absolutely cracking, with near perfect blue skies and much sunshine. The road was reasonably quiet but there were a fair few trucks using the route, and one had to be very wary of them as they seemed to be either going much faster or much slower than me. Otherwise the journey was pretty steady. A continuous stream of lakes and rivers enlivened the endless woodlands, but the mountains never seemed as close or as dramatic as other journeys in the last few days. Despite this there were many turn offs for ski areas and resorts, so those narrow roads leading away from the main highway must lead somewhere hilly. After about 200km, (or a couple of hours), of cruising along the Southern Yellowhead it was time to top for some lunch. 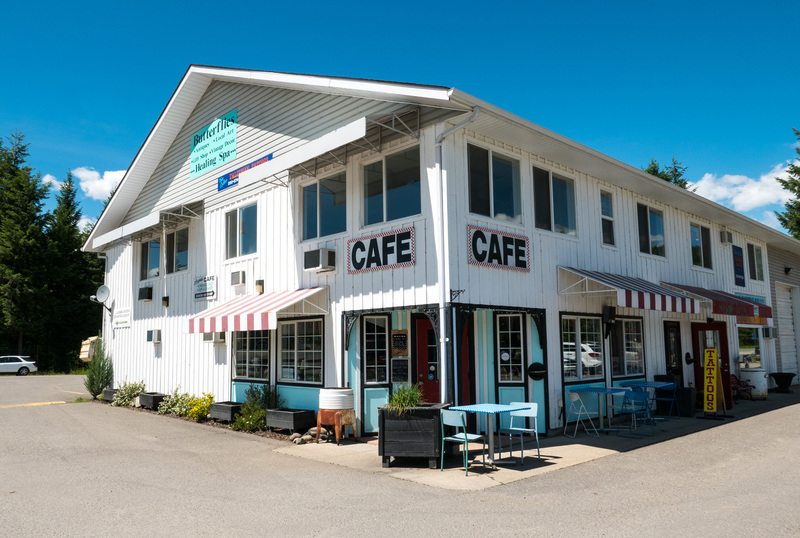 Conveniently as this call to food came we were passing by the township of Clearwater, which seemed quite busy and prosperous. We noticed a couple of chain restaurants. but I let them go by and then spotted this cute little cafe on the corner of a block. “we’ll try there”. We appear to have stumbled upon O’Bryans Corner Cafe, situated next door to a wellness clinic and a tattoo parlour. It was a little gem, belied by its simple exterior. Inside was basically a shrine to the era of rock & roll, with a side helping of ice hockey. Every wall was crammed with memorabilia, photographs and posters relation to one or the other of the owner’s twin infatuations. I love places like this, and so obviously do the locals, who cheerily chatted with the two ladies behind the high-top counter. Lunch was just a sandwich, but home made whilst you wait and not even the slightest sign of mass production. A really enjoyable experience that was hard to leave. But leave we did, back into the blazing sun and the long drive. In theory Sun Peaks was just over another 100km down the road and we should be there for late afternoon. However, as we closed in on the city of Kamloops, and took our left turn off the Yellowhead towards the mountains, we found the road ahead closed. Instead a diversion directed us up an even smaller road on the left hand side of this road. The sat nav was not at all happy about this, but with no choice we persevered and after a few minutes it stopped complaining and accepted its new route. A diversion on to a minor road like this is not what you need after 400km of driving, so I was in a similar state of mind to the sat nav for a few miles, until I too accepted my fate and stopped grumbling. This new road up to the resort was quite narrow and soon began climbing rapidly. it seemed to go on for ages, but in reality it can’t have been more than 30 minutes before the town opened up before us. And what a strange town it was. Modelled on the pastiche of an Alpine village, it was a bricolage of visual cues such as steeply-roofed chalet-styled buildings, faux-cobbled pedestrian streets and brightly coloured shops with restaurants on the ground floor. The steep ski lifts rising up from just a few yards beyond were the final touch. This was all rendered entirely incongruous and somewhat strange by the twin glaring absences of any snow or apparently any people. Our hotel was the oddly named Coast Sundance Lodge, which turned out to be a gigantic four storey Swiss chalet of a building at the foot of the largest ski lift in town. It was handy for the shops and restaurants though, as they were just around the corner. The hotel interior had a careworn and empty feel about it. Our room was was the largest we’d had so far with lobby for snow gear and a kitchenette. 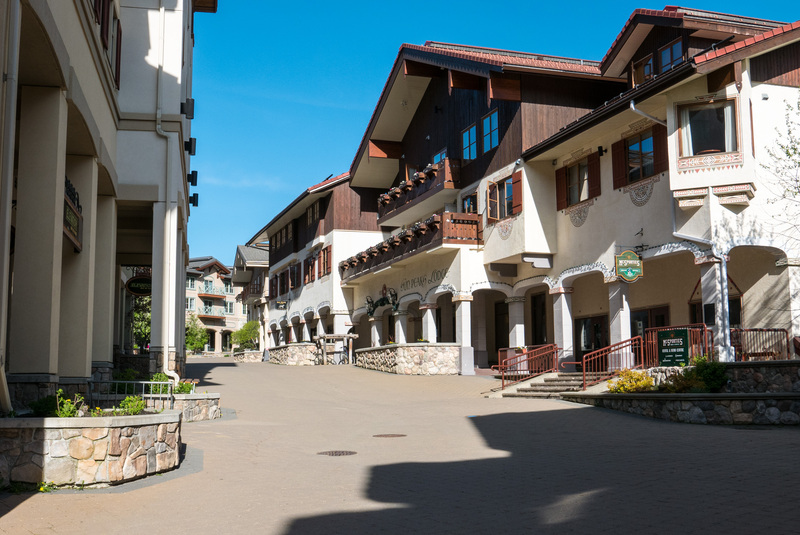 Everywhere the hotel felt it was designed to accommodate families with skis and snowboards, instead of being empty and echoing. It was hard not to think of “The Shining”. The semi deserted ski village of Sun Peaks, British Columbia. On exploring the village, which turned out to be fairly small, and most of the shops were on the verge of closing as it was late afternoon. That night we ate at an Italian place, one of a handful that were open. “Booking is advised”, both the hotel concierge and the restaurant website advised us. We were one of only half a dozen customers.